Seychelles’ active civil society covers a variety of different sectors which include manufacturing, education and the environment. These NGOs must register under the Associations Act of 1991. 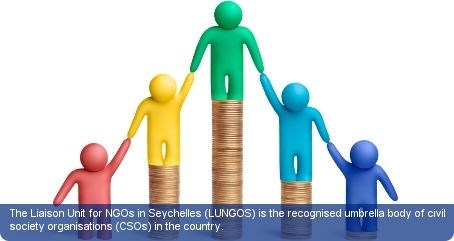 The Liaison Unit for NGOs in Seychelles (LUNGOS) is the recognised umbrella body of civil society organisations (CSOs) in the country. Its broad membership of non-governmental organisations (NGOs) and other CSOs reflect the significant involvement of NGOs in society. The membership includes amongst many, the Marine Conservation Society (MCSS), which promotes public awareness of the marine environment; the National Council for Children, an active advocate for children rights; the Cancer Concern Association which educates the public on cancer issues; and the Seychelles Women’s Commission, a gender rights NGO. Many of the country’s international NGOs which operate in the country are predominately in the environmental sector with other organisations supporting food and agriculture, women’s rights and peace. In Seychelles, about 15-20% of the workforce makes up trade union membership. The sole major union, the Seychelles Federation of Workers’ Unions, is currently the trade union centre of the country and is affiliated with the International Trade Union Confederation. The 1993 Trade Union Industrial Act permits workers to join and form unions with the exception of public sector personnel.